To paraphrase a hoary old cliche, I don’t know much about ‘graphic novels’ but I know what I like. 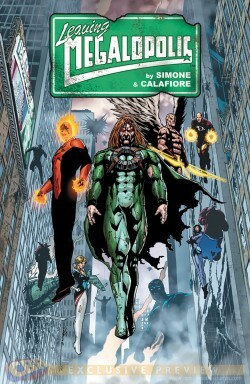 And I gotta say I was impressed with the clever concept and bravura artwork of LEAVING MEGALOPOLIS. Writer Gail Simone and illustrator Jim Calafiore visualize an urban nightmare in which superheroes suddenly turn on the (very) human residents of a large city. So why not read some Jean-Paul Sartre, go into therapy or take some “happy pills”?